This August, we celebrate Buwan ng Mga Wika. This is the time when students showcase their talents in Balagtasan and writing competitions for the promotion and appreciation of our national language. It is also the best time for every Filipino to be proud, not only of our language and literature, but also of our culture and history. Now, not everyone is fond of history, especially with some of our experiences in learning it in school. Memorizing a litany of forgettable facts? Most of us have been there. It’s tedious to remember all the names and dates, right? Who cares if we know the names of the ships Ferdinand Magellan and his crew sailed on as they arrived in Homonhon in 1521? Would that make us rich? But it’s never too late to give history another chance. While there are many things that can be done to improve how history is being taught in school, students, and even non-students, should also go the extra mile to learn about the past on their own. 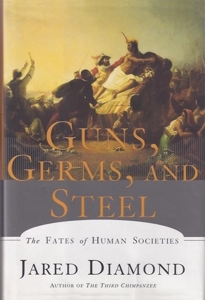 So, here’s a book recommendation: Guns, Germs, and Steel: The Fates of Human Societies by Jared Diamond. Published in 1997 and winner of the 1998 Pulitzer Prize for nonfiction, Guns, Germs, and Steel offers a refreshing and interdisciplinary approach to history as it brings us to a journey to the last 13,000 years. It draws concepts from various fields such as anthropology, ecology, geography, zoology and evolutionary biology in order to explain how and why human history turned out the way it did. Specifically, the book seeks to explain how and why European civilizations flourished at a faster rate compared to others, and eventually ended up colonizing the rest of the world. In familiar terms, why didn’t Lapu-Lapu, the ruler of Mactan, Cebu, manage to develop the technology in order for him to reach Europe before Magellan arrived in the Philippines? How did European civilizations acquire guns, germs and steel before any other civilizations? Thirteen thousand years of human history squeezed in a single book? You might think it’s only a passing survey of the past, but you will be surprised how detailed and substantial it is. Not your typical history book or textbook, but more of a narrative of the entire human experience—the story of all of us. Here are reasons Guns, Germs, and Steel should be in your to-be-read pile. At some point, you might have heard of the phrase “past is past,” or maybe have even used it about a hundred times yourself. It is like putting the past on the backseat—forget about it, and then move on. The mantra is: why dwell in the past if we live in the present and should focus on the future? That sounds more practical than thinking about things that cannot be changed anymore. This notion also explains why some people think studying history is trivial. So why do we need to read Guns, Germs, and Steel again?? Most of us don’t even have a strong grasp of Philippine history, let alone world (pre)history! But what can we get from it? To put it simply, it’s like tracing our family lineage and rediscovering our roots and heritage but on a grander scale. Shouldn’t we be curious about the early lives of our lolos and lolas and their lolos and lolas and so on? Imagine beginning a novel from page 100. Will the story make sense? It’s about knowing ourselves better as humans (and Filipinos), knowing where we came from and learning from those who came before us. This is how we can make sense of our present, and be better equipped for what lies ahead. One of the greatest achievements of humankind is the invention of agriculture. Through this, humans managed to free themselves from the mercy of the environment for their sustenance as they learned to grow their own food. This discovery also paved the way for humans to become sedentary and start their village life. In the book, Diamond discusses in great detail how geography affected the onset of food production and animal domestication across the world. He dissects the geographic differences and how these affect the availability of resources in various regions, and how some societies managed to efficiently utilize such resources to get a head start. The conclusion is that some societies had the geographic advantage to flourish at a faster rate compared to others. Agriculture soon spread and gave societies the luxury of food surplus, which directly translated to more people, which meant increased productivity. It also helped develop more specialized skills and roles in society that led to novel discoveries, hence: writing systems, literature, mathematics, architecture, governments, religions, empires! Agriculture independently developed in only a few select regions, one of which is the Fertile Crescent where most of the oldest civilizations flourished. It just spread from one region to another and, eventually, across the world. Of course, there was a lag in the transmission of technology, so our ancestors inherited agriculture at a much later time. Nevertheless, it was a game changer in human history. But this leads us to wonder: How come only few of us, Filipinos included, want to become a farmer? If you sang that line, it’s likely you have seen the Disney animated film Moana, which follows the story of the strong-willed girl from a Polynesian village, who was chosen by the ocean to reunite a mystical relic with a goddess. Moana fascinates us Filipinos because it carries our shared Austronesian heritage: respect for elders, the village life, the coconut, the nipa hut, the chicken, the pig, the boat, the ocean. But what if I told you that Moana’s story is a chapter in Guns, Germs, and Steel? Yes, it is! The book, just like Moana, discusses the Austronesian migration that influenced and brought us our rich maritime and agricultural cultures. But since it’s Buwan ng Mga Wika, what I would like to highlight instead are our languages, which we also inherited from that particular migration. Some may have taken notice of the slight differences on the celebration label. Many of us celebrate August as Buwan ng Wika or Buwan ng Wikang Pambansa, but only a few celebrates it as Buwan ng Mga Wika. While all those labels are acceptable, personally, Buwan ng Mga Wika signifies our diversity best, and gives justice to all 180+ languages in the Philippines. Going back to Guns, Germs, and Steel, various societies developing at different paces because of geography somehow addresses the issue of racism. It indicates that certain societies developed faster not because of their inherent superiority, but rather because of the advantages brought by their environments. These advantages gave those societies a running start to develop newer technologies en route to acquiring guns, germs and steel, which became the means to colonize the rest of the world. This presumption questions the perceived superiority of certain groups or “races.” It reinforces the notion that there is actually no inherent superiority or inferiority among humans in terms of intellectual capacity. Diamond explains how the disparity among human societies came to be through the lens of geography, and how it drove human history as we know it today. In essence, the book reminds us to be proud of the color of our skin and forget about our perennial “white love” tendencies. Every culture and ethnicity in the world has intrinsic value and no person, regardless of any circumstances, should be looked at as someone inferior just because he or she comes from a certain group or place. There’s a caveat, of course. We should also remember that we should be proud for the right reasons. We should not put ourselves on the pedestal at the expense of other people. We should not look down on indigenous peoples’ customs. We should not condemn the poor. We should not laugh at other people’s accent or language. We should not judge people based on the color of their skin. Always remember that every human being has an equal value and dignity, as well as the potential to become whoever they want to be. Okay, so do we just accept that we’re “victims of geographical circumstances”? No, because the greatest factor in shaping history is not the environment. It is us, humans. And in Guns, Germs, and Steel, human creativity, agency, and autonomy are highlighted. While it’s true that environment plays a role in our development, our capability to think and to control our fate is much more significant. We have the power to change society for the better and to drive the fate of human societies for the next 13,000 years.